"Springer" from William Taplin's 1803 book "A Sportsman's Cabinet, etc." I enjoy finding the source prints for a transferware patterns almost as much as I enjoy finding the pottery. I like to compare the way the different potters used the same source print. 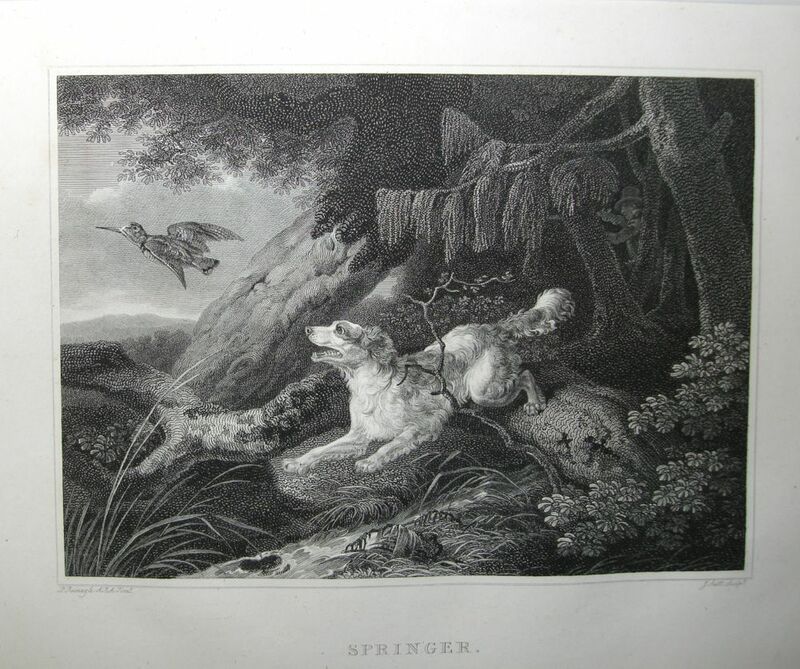 One of my favorite source prints is "Springer" from William Taplin's 1803 book "A Sportsman's Cabinet: Correct Delineation of the Various Dogs Used in the Sports of Field," 1803. Such a long title! 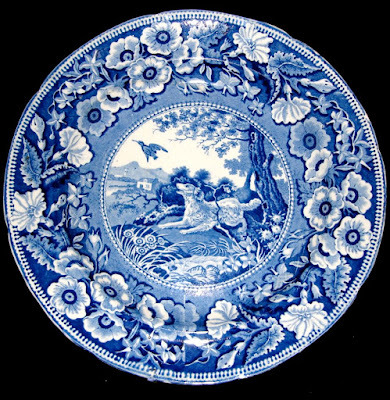 Ralph Stevenson (& Son) 1810-1835 10 inch plate. Can you find the hunter? 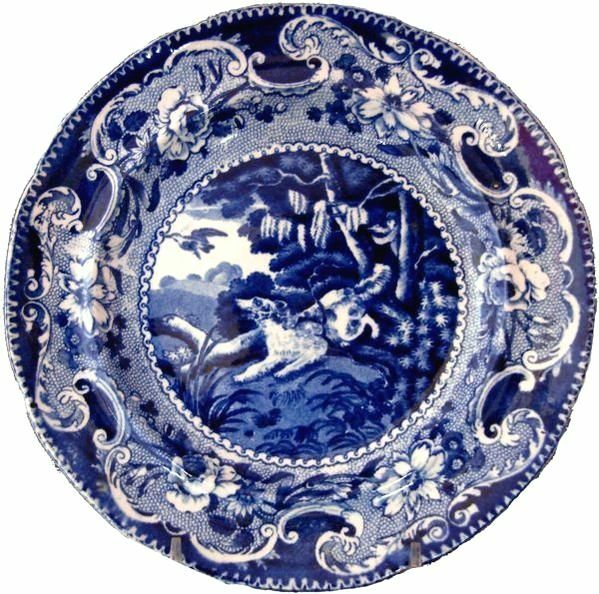 Above is a 10 inch plate by Ralph Stevenson (& Son) 1810-1835 circa 1820. Stevenson used everything in the source print except the hunter. Perhaps he is hiding behind the tree! 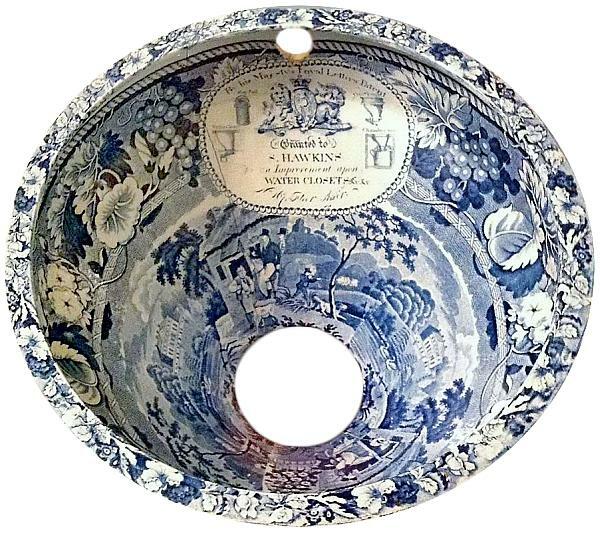 Enoch Wood & Sons (1818-1846) 6 inch plate with a copy of the "Springer" source print. If you want to see the hunter more easily, click on the photo to make it bigger. 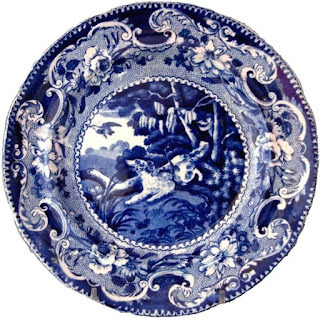 Enoch Wood & Sons copied the same pattern on a 6 inch plate. Wood kept the hunter, but he is hard to see. Look carefully between the two trees on the right. 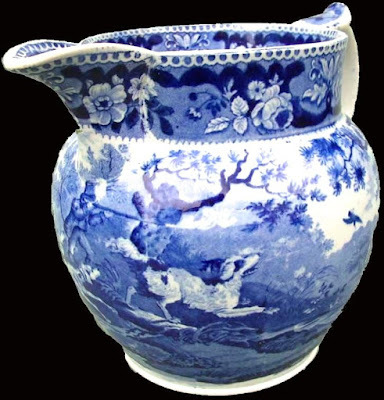 The Transferware Collectors Club Pattern and Source Print Database shows four patterns that feature the Springer Spaniel. The two above, a third on a jug, and one that is part of a composite transfer on a portable commode (water closet). Unknown Maker 5.9 inch jug. The springer spaniel and the hunter are now on the left. Here is an Enoch Wood & Sons Grapevine Border Series portable commode. The main scene shows Doveridge Hall, Derbyshire, but if you look carefully above the hole in the center, you can see the hunter and the springer spaniel. Remember to click on the photo to make it larger. 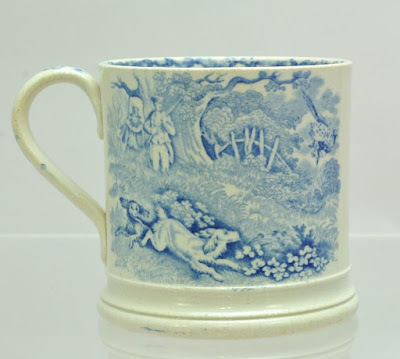 I recently purchased a 4 inch mug with another example of the springer spaniel pattern. The hunter and the dog are part of the transfer, but the bird is missing. 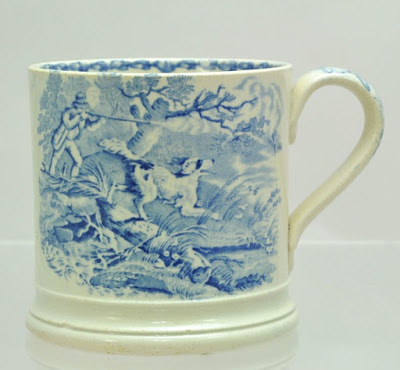 However, the other side of the mug shows two more dogs, two hunters, and a rather large pheasant. 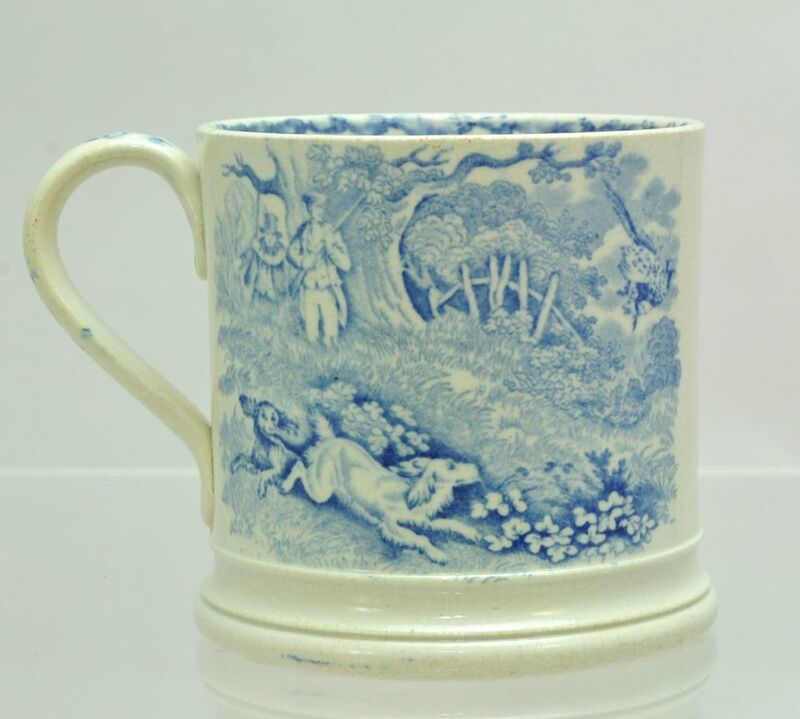 Unknown Maker springer spaniel and hunter 4 inch mug. 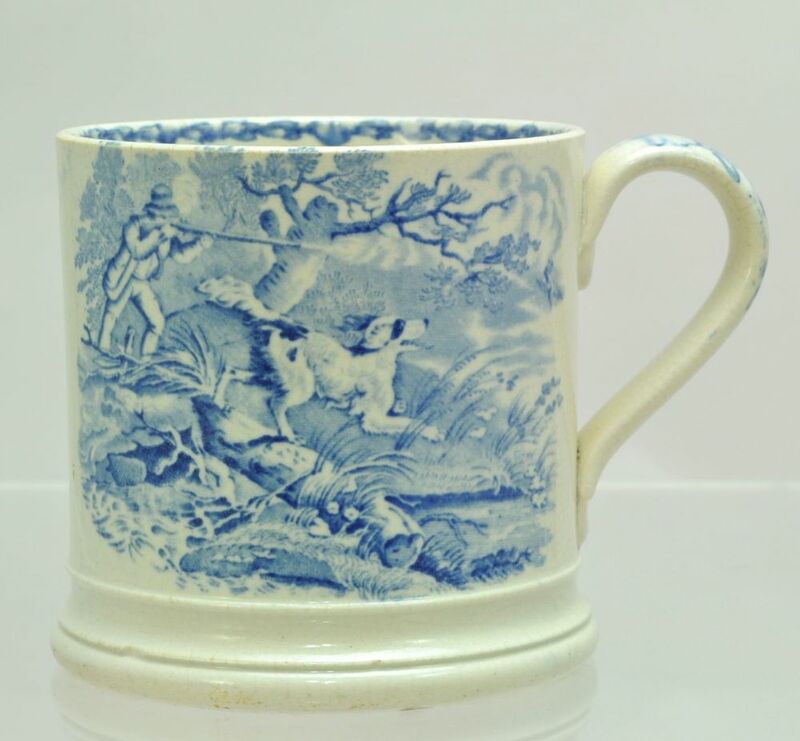 Other side of the springer and hunter mug shows two dogs, two hunters, and a rather large pheasant (see it on the right). I have shown you five patterns that copied the "Springer" source print. I am sure there will be more.